CYSA Futsal Program – For several years Charlestown has participated in a Futsal league which starts after the Fall outdoor season ends. CYSA feels as if it is great offering for those families interested in staying active in a competive environment between the Fall and Spring seasons. Futsal is a fast paced, indoor game, which improves technical skills and applies strategies that translate to field soccer. Registration will begin for boys/girls U11, U12 and U13 in September and based on demand, CYSA will assign your child to a team by mid October. Practices will start soon after the Fall outdoor season ends and will be an hour long, once a week. Games will take place on Saturday’s or Sunday’s in the Boston area from November through mid-January. Each regular season match consists of two equal halves of 24 minutes. A two-minute half-time period will occur between halves. Teams may call one one-minute timeout per half (when in possession of ball, ball out of play). There is no overtime, injury time or stoppage time. Teams are comprised of four outfield players and one goalkeeper. A team must have three players to begin a match. No team may have fewer than three players on the pitch at any time. The goalkeeper must wear a different color jersey than the outfield players. All players must wear the following: shirt, shorts, shinguards, socks, non-marking sneakers -- no exceptions. No casts or splints are allowed. Players may not wear eyeglasses. Sport-specific eyewear worn with a strap are okay. Jewelry, watches, earrings, metal barettes and other dangerous items are not permitted. There is no sliding in futsal (see goalkeeping exception below). There is no offsides in futsal. Although some contact is unavoidable, futsal is largely a non-contact sport. In addition such legal contact shall not be careless, reckless or excessive. All substitutions are on the fly, this includes goalkeeping substitutions. Referees will not stop play for goalkeeping substitutions. Coaches are requested to change goalkeepers during halftime, during timeouts and after the opposing team scores. A substitute may not enter the match until the player leaving the match is at the touchline in the substitution zone. Coaches are asked to have players slap hands at the touchline to ensure that no more than five players are on the court at once. Any substitute who enters the field of play before the player being replaced has completely left the field of play will be shown a yellow card. All substitutions must take place in front of the team bench -- not at the half-way line. All teams will switch benches (and ends) at the beginning of halftime, ensuring that all substitutions take place in the defensive half. Kickoffs: are indirect. The ball must be played forward first. Tapped balls are not in play – the ball must move forward. Goal Clearances: are taken when the ball wholly crosses the goal line after being touched last by the attacking team. The goalkeeper must use his hands to roll, bounce or throw the ball from anywhere inside the penalty area to outside the penalty area. U14 and younger: The ball may not cross the half-way line without first being touched by the ground or another player. U15 and older: Goalkeepers may throw the ball directly across the half-way line. In these leagues, goal clearances are indirect. A ball thrown directly into the opposing goal results in a goal clearance for the opposing team. U10 and younger: All opposing players must be in their own half when the ball is released by the goalkeeper. Corner Kicks: are direct. The ball must be placed directly on the corner spot and the kick must be taken within 4 seconds. Free Kicks: may be indirect or direct. The ball must be stopped completely before the kick may be taken. Penalty Kicks: are taken from the penalty spot and must be shot at goal by a clearly identified kicker. Defenders may not be nearer to the ball than 16 feet and must be behind an imaginary line running from touchline to touchline even with the penalty spot. Distance: For all of the above, except goal clearances, opponents may not be closer to the ball than 16 feet. Ceiling: If the ball hits the ceiling or other object, the team that did not touch the ball last restarts play with a kickin from the nearest point on the touchline. Indirect Free Kicks: When a player plays in a dangerous manner, impedes an opponent (without playing the ball), slides, prevents the goalkeeper from releasing the ball with her hands or commits any offence for which play is stopped to caution or eject a player. Direct Free Kicks: When a player kicks or attempts to kick an opponent, slidetackles an opponent or slides with an opponent near (automatic yellow card/caution), jumps at an opponent, charges at an opponent, strikes or attempts to strike an opponent, pushes an opponent, holds an opponent, spits at an opponent or handles the ball deliberately. Yellow Card / Caution: The offending player is shown a yellow card. Coaches are encouraged to remove the offending player from the match at this time. If a player earns two yellow cards in a match, he is shown a red card. If a player earns three single yellow cards during any league session (including friendlies), he is suspended for one game. Red Card / Ejection: The offending player must leave match and facility. The offending team plays down for two minutes unless scored upon before the two-minute penalty expires. The offending player serves a minimum one-match suspension. Any player that earns two red cards during a league session will be suspended for the remainder of the session, including playoffs. Accumulated Fouls / AFPK: All penal fouls are recorded on the scoresheet and on the scoreboard. If red fouls blue a sixth time in one half, for that sixth penal foul and all subsequent penal fouls in that half, blue is awarded an accumulated fouls penalty kick. If the foul occurs farther from the attacking goal than the second penalty spot, the AFPK is taken from the second penalty spot. If the foul occurs nearer to the attacking goal than the second penalty spot (but outside the penalty area, of course), the attacking team may choose whether to take the AFPK from the second penalty spot or from the spot of the foul. All AFPK's must be shot at goal by a clearly identified kicker. The defending team may not make a wall and may not be nearer to the ball than 16 feet and must be behind an imaginary line running from touchline to touchline even with the spot of the kick. The goalkeeper may be off her line, but may not be nearer than 16 feet from the ball. Accumulated fouls are reset to zero at the beginning of the second half. Advantage: Advantage will be applied in futsal, with penal fouls still counting as accumulated fouls. If the referee shouts, "play on" and gestures with both arms, the foul was a penal foul and will be counted accordingly. If the gesture is with one arm, the free kick would have been indirect and thus does not count toward the total. Must wear a different color shirt. She may wear long pants and/or other padding as deemed safe by the match referee. May slide in his own penalty area but only when playing the ball. May receive a kickin directly. May kick the ball directly over the half-way line. May score directly with his feet during the run of play. May not possess the ball for more than four seconds in her own half. At U15 and older, goalkeepers may throw the ball directly across the half-way line. In these leagues, goal clearances and other distributions are indirect. A ball thrown directly into the opposing goal results in a goal clearance for the opposing team. At U15 and older, goalkeepers may only touch/receive the ball once per team possession unless the ball crosses the half-way line or is touched by a player from the opposing team, after which time the goalkeeper may touch/receive the ball again. No player is eligible unless formally on the team's roster, which must be presented to a match official prior to kickoff. Sibling teams may swing a maximum of three players from their sibling roster per game. Teams may not swing players during playoffs. 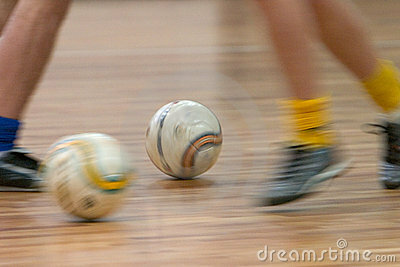 Only futsal balls may be used inside the facilities. Balls may only be used inside the gymnasium. Players may stretch and loosen in the hallway but may not use balls. Soccer balls, w'heelies and soccer cleats are not permitted inside facilities. All players must change their footwear in the facility lobby before entering the gymnasium. Coaches with wet or dirty feet must change their footwear as well. U12 and younger leagues will use size 3 ball; U13 and older leagues will use a size 4 ball. In most cases match balls will be provided by the league; however, in the event a match ball is not provided, the home team is required to provide a match quality ball. Teams are expected to arrive a minimum of 20 minutes before kickoff. Teams are responsible for providing their own medical supplies, including ice. In the event two teams are wearing the same color, the home team must change colors and must do this before kickoff. If your team doesn't have a change strip, please be sure you have pinnies. Head coaches are responsible for controling the conduct of their assistants, managers, players and spectators.